Hypoallergenic rose gold PVD coated 316L surgical steel barbells secured by 3mm screw-on balls. Available in 6mm and 8mm bar lengths. I got these in 6mm as my piercings are still relatively new, but the 8mm original barbells kept catching my hair. There was some swelling when i changed my piercings (as i say, still new) but that went away overnight, as these are surgical steel i have had no reactions and can keep them in 24/7 with no snagging or irritation! Very comfortable to wear 24 hours a day. 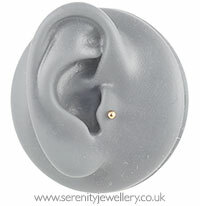 I am wearing this in my helix piercings and I have had no problems. Would recommend. Easy to use website, fast delivery and perfect jewelery. I love everything I've bought from Serenity Jewellery. Very small, they look great with hair up and with different colour bars in to. Great value for money and speedy service.